All law students in England, meeting the law of torts for the first time, used to study Scott v Shepherd. That was a case decided in 1773 in which a man in a marketplace was struck in the face by a lit firework that put out his eye. The legal rule was — if you toss fireworks, you are liable for blinding a man, even if you didn’t mean to. In the preliminaries to this week’s meeting in St. Petersburg, the Turkish President, Recep Tayyip Erdogan, has been playing games with fireworks. The President of Russia, Vladimir Putin, wasn’t closing his eyes. At the conclusion of their meeting in St. Petersburg on Tuesday afternoon, Putin’s eyes revealed more than his mouth about Erdogan’s incendiaries. Officials on the Russian and Turkish sides, and their staffs, have already made clear there are four strategic points on the agenda of Russian-Turkish negotiations; one political corollary; and several commercial payoffs. The priority is the commitment from Turkey to stop attempts at regime change in Syria, the Russian Caucasus, and the CIS states, including Armenia and Tajikistan. This means the expulsion of Chechen fighters from their havens in Turkey and areas under Turkish control; closure of the Turkish-Syrian border for ISIS and other jihadis; and an end to Turkish support for the Azeri war against Armenia and for Islamic oppositionists in Tajikistan, Uzbekistan, and Crimea. In return, the Turks want a Russian commitment not to support Kurdish groups to establish territorial autonomies or statelets along Turkey’s borders with Syria and Iraq, nor encourage the Kurds to fight their way back into Turkey to establish an independent Kurdistan. 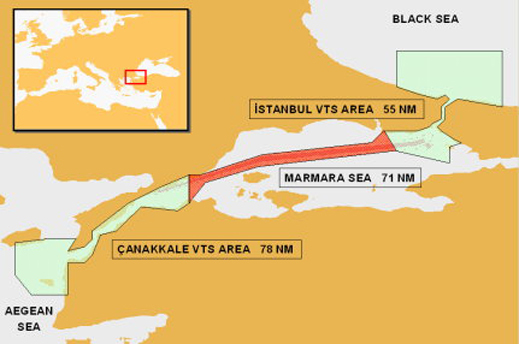 For details of vessel operating conditions in the so-called Turkish Straits, read this. The political corollary is that Russia and Turkey will not allow the US and NATO to establish and arm Turkish forces under a NATO flag on the territory of Cyprus. 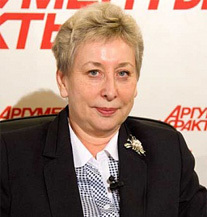 The payoffs include revival of plans to increase Gazprom’s flow of gas to and through Turkey, in either the Turkish Stream or South Stream variants; resumption of Russian tourism to Turkey; removal of mutual restrictions on construction projects on both sides, including the Russian nuclear reactor at Akkuyu; and an end to Russian sanctions banning Turkish fruit and vegetable exports to the Russian market. Left: the nuclear reactor site at Akkuyu; right, the 2011 plan of the reactor layout; for details, click. Just before Erdogan’s arrival in St. Petersburg, he and the Kremlin agreed to stage a television interview in which Erdogan mixed several metaphors to ingratiate himself with the Russian audience. The meeting with Putin, Erdogan claimed, is “a new landmark in bilateral relations, a clean slate from which to start anew.” Erdogan referred to the Russian president as his “dear friend Vladimir” every four minutes of the interview. Read the Tass version in English. He denied any role in the financing , oil trade, weapons and other supplies for ISIS forces in Syria and Iraq. He repeated Turkish backing for the Crimean tatars fighting Moscow with support from Kiev and Washington. The Tass interviewer, deputy director-general of the news agency Mikhail Gusman, carefully avoided mentioning the Chechens, the Straits, NATO, Cyprus, Crimea, or the Azeri-Armenia war. “Let’s see how the western main stream media spins the latest, in what is becoming a long list of Putin victories, over the teleprompter President [Barack Obama]”, claimed an English-language website funded by the Kremlin. 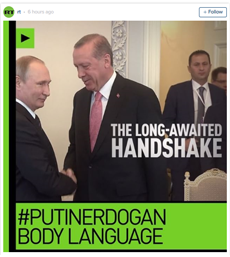 RT tweeted in celebration (right) , claiming “the two leaders were effusive in their praise for each other”. Sputnik News called the meeting a “reset” adverse to the US and the European Union. The official record of the delegation talks, which started at 1 in the afternoon, and ended after three hours, reported no discussion and no agreement on a single Russian political or security priority. The presidential press conference revealed that despite declarations of best intentions, nothing of importance to either side was agreed. The Russian Foreign Ministry has reported nothing on Foreign Minister Sergei Lavrov’s meeting with his counterpart, Mevlüt Çavuşoğlu, hours after it concluded. Although Kremlin officials had earlier announced the Turks would be asked to pay compensation for the Turkish killing of the Su-24 pilot, Oleg Peshkov, there was no discussion of this issue. Russian media reports identified as participating in the talks General Valery Gerasimov (below, left), head of the Russian General Staff, and Alexander Lavrentiev (centre), the intelligence officer who is the Kremlin negotiator for the Syrian war. There was no officer from the rebellious Turkish military in Erdogan’s delegation. 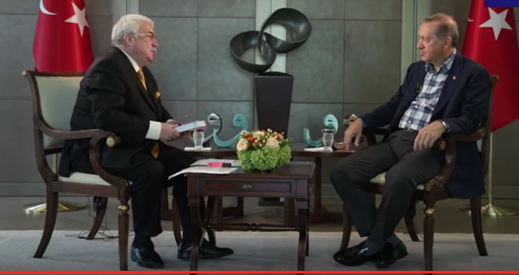 Instead, he brought Hakan Fidan (right), the US-educated chief of the Turkish intelligence agency, MIT. Putin’s demeanour throughout the press conference was grim. Not since his press conference in June 2013 with US President Barack Obama has Putin’s body language been as demonstratively hostile to his counterpart; click to open. Putin was much more relaxed and affable during his meetings two days ago with the Presidents of Iran and Azerbaijan, Hassan Rouhani (below, left) and Ilham Aliyev (centre). 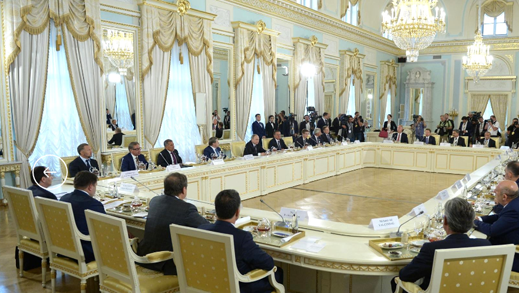 The Kremlin issued a videotape and several large photographs of Tuesday’s session of Russian and Turkish businessmen over which Putin and Erdogan presided. The published text of the session reiterated conditionals. “From you, businessmen,” Erdogan passed the buck, “we wait for serious steps in respect of the embodiment of projects which will make a contribution to economic development between our two countries…If we remove all obstacles before our trade relations and we will create new areas for cooperation, I think, we can achieve these objectives. Therefore the serious weight of this freight falls also on your shoulders, our dear businessmen.” He referred once to the Bosphorus Straits only to mention that he is about to start building a tunnel underneath. Putin was referred to as “dear friend” only once in his six-and-a-half -minute speech. Putin grimaced and fidgeted. The two presidents recited the trade statistics confirming the extent of the financial losses Turkey has suffered since the start of sanctions last December. Trade turnover in the first five months of this year has fallen from $10.7 billion to $6.1 billion, a loss of $4.6 billion. The Turkish share of Russia’s global trade has dropped from 4.8% to 3.6%. The table shows Erdogan’s farm and food trade constituents have suffered losses to May 31 of $812 million; more than $1 billion by the time Erdogan arrived yesterday. The losses are concentrated in several segments of the Russian food market. The Russian Customs Agency has reported that Turkish tomatoes, which held 57% of the import market in value before the Su-24 was shot down in November, have been wiped out. Turkish apricots, strawberries, peaches, onions, and cucumbers have also occupied large shares of the Russian market, but have been hit hard since January. Alexander Khorev of APK-Inform, a leading Moscow consultancy on the food trade, says that last year — before the Turkish conflict but after sanctions cut supplies of vegetables and fruit from the European Union — Russia purchased a total of 665,000 tonnes of tomatoes, of which the Turkish share was 52% in volume. The imported cucumber supply totalled 545,000 tonnes; 23% of them from Turkey; and 264,000 tonnes of onions, 14% of them Turkish. One of the curiosities revealed in the customs figures is the apparent leap in the volume and value of Armenian tomatoes. Moscow sources say the volume of Armenian tomatoes imported to Russia this year exceeds the capacity of Armenian growers to ship them. 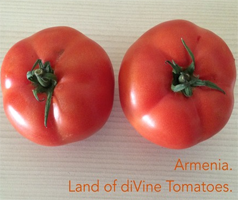 The suspicion in the Moscow trade is that the Turks have been smuggling tomatoes into Russia disguised as coming from their arch-enemy, Armenia. One reason Putin said nothing about reviving this trade is that Russian growers have invested swiftly in greenhouses, subsidized in part by state banks, in order to produce import substitutes. They are relying on keeping the market share and price point which the Turks enjoyed nine months ago. Alternative sources of imported supply—Syria, Tunisia, South Africa, Uzbekistan, Iran and Armenia – have also gained at the Turks’ expense. Philip Owen of Volga Traders comments that it is costly to set up logistics, payment and marketing arrangements for imported foodstuffs, and so the Russian market may not return to Turkish suppliers. Erdogan provided no political reason for the Kremlin to revive Turkey’s food trade; Russian growers say there is now good reason not to do so.